Tag Archive | "indie film"
The Dead Matter movie to be released on July 30th. Midnight Syndicate Films has announced that The Dead Matter movie and soundtrack will be released on July 30th. Production on an interactive website that allows fans to delve deeper into the world and characters they will encounter in the movie is underway. A set of three new trailers, the first of which will be released in February is also in production along with a mini-documentary produced by Smudgeline Productions and other behind-the-scenes featurettes. All of these items and more special features to be announced soon will be included on the DVD release. This is an APB to horror movie buffs within range of Madison, WI. The Madison Horror Film Fest invades Market Square Cinema at 6604 Odana Rd in Madison WI this weekend and yours truly will be there. The fest kicks off at noon on Saturday, Oct. 3rd and goes through Sunday night. 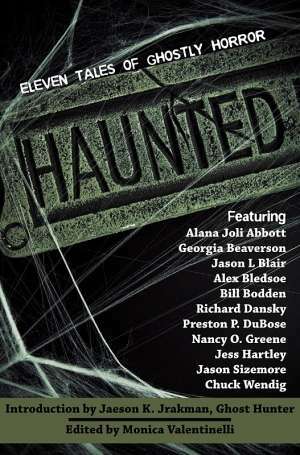 You can expect an onslaught of indie horror shorts, features, vendors and guests including Debbie Rochon, and Bill Rebane. Highlights will include a screening of Re-Animator followed by a Q&A with director Stuart Gordon and a “Women in Horror” presentation hosted by Elske McCain and Scarlet Salem. Check back next week for my full recap of Saturday’s events and if you see me at the fest feel free to say hi. Life-hating Goth girl Lara Baxter just turned 16. Her birthday party mojo never materializes after her more popular sister, Helen, steals her thunder. Shunned by her secret crush and neglected by her own mother, Lara retreats to the sanctuary of her altar to Ann Rice where she casts a spell on Helen. The next day Helen wakes up bleeding profusely from her nose and dies a short time later. Just as the family begins to mourn, Helen comes back from the morgue delirious and with an insatiable thirst for blood. Older brother Raymond, a cross between Re-Animator’s Dr. Herbert West and Milwaukee’s own Jeff Dahmer, performs some tests on Helen’s blood in his bedroom/laboratory and determines that she’s a vampire. In recent years America’s horror cinema has been much like its cuisine: bland interpretations of foreign delights and mass produced fast food, serving the same burger over and over again. The watered down and over-produced plethora of Americanized Japanese ghost movies has actually managed to render the originals as unwatchable clichés, while last year’s Quarantine was an inferior redo of the Spanish chiller, [REC]. And to add insult to injury these movies were essentially released simultaneously (thankfully, [REC] is now available on DVD). 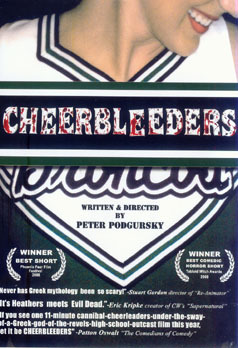 Cheerbleeders is a short horror film by Peter Podgursky, the proud owner of a MFA in Film Production from USC. 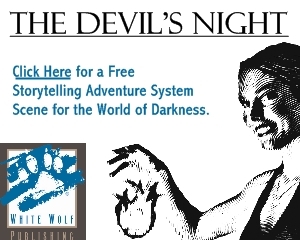 In fact, these eleven minutes of cinematic fun comprised his thesis project and it has since made the rounds at several horror film fests winning best short at the Phoenix Fear Film festival 2008. Here’s the dirt: Best friends, Penny and Devon (Laurel Vail and Wyatt Fenner), are high school misfits in Blackfoot, Idaho – a tiny and isolated burg. When Penny brings an ancient urn to class, it accidentally spills its black slimy contents on Devon. This black sludge is essentially a gnarly love potion, turning him into…gasp…the most popular kid at school! Drunk with power, Devon holds sway over everyone, including the cheerleading squad, which he commands to massacre the football team, midgame. Can Penny stop the insidious evil known as unrestrained adolescent popularity?